There was a rattle on the oak bedside table. Ernest ignored it at first but it continued. He turned on his left side and switched on the tall, thin silver lamp. Lynn groaned beside him. Ernest tried to reach for his glasses but knocked them to the floor instead. He lifted his phone and through blurry vision he could see the face of his assistant, Bernadette. He answered the call. There was a commotion going on in the background. He and Lynn had gone to bed early that night. They were leaving on a flight to Luen in a few hours so they wanted to get some rest whilst they could. Ernest had entrusted Bernadette with over seeing the Free Fall Benefit, a charity function supporting a rare owl species being held at the Beckingridge Tower block in City Main. “Are you sure you don’t want to be here?” Bernadette had asked earlier that afternoon as Ernest passed her the itinerary for the evening. There was a scream in the background. Lynn must have heard it too because she sat up and switched on her own lamp. Both of their bodies were now filled with such adrenaline sleep was but a distant memory. Bernadette’s voice came through again, cracking with emotion. “They’re killing themselves!” she cried. Lynn laid a hand on his shoulder. He turned to her. He had never seen such fear in her eyes. Bernadette’s voice faded. “What’s happening now?” she asked someone beside her. “What is going on?” Ernest asked again. Bernadette’s voice came back clearer. More screams erupted around her. The phone line went dead. “What’s going on Ernie?” enquired Lynn. He pulled a pair of jeans from the drawer and slipped his leg into them. “Something about clients and investors leaping from the building. Children being …” He hesitated. He didn’t want to upset Lynn any more than she already was. “Some children have been shot.” He decided to divulge what Bernadette had told him. She would no doubt read it in the Daily anyway. Lynn gasped and covered her mouth with her hand. The mauve coloured nail polish matched the luggage she had placed downstairs in anticipation of their early departure. It was a trip they would no longer be taking. “I have to go down there,” he informed her even though she already knew that. “I’ll come with you,” she offered. The Beckingridge Financial Firm wasn’t Lynn’s and it never would be but for Ernest’s sake she had taken a keen interest in its smooth running. Ever since his wife died and his son was taken, the firm had neared collapse. George was still missing. 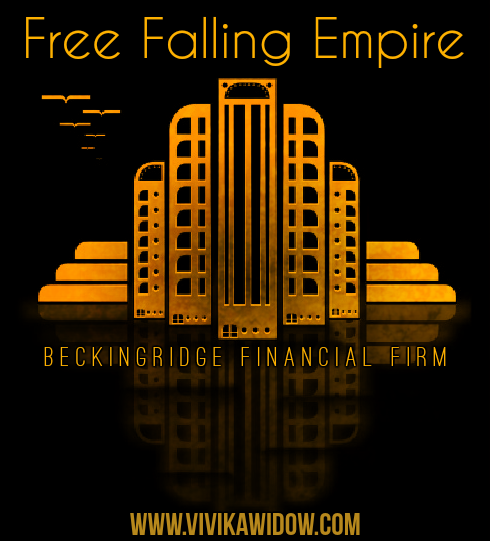 Embezzled funds had almost toppled the great Beckingridge empire. Lynn reluctantly agreed. She kissed Ernest as he pulled comfortable shoes onto his feet. She watched from the window of the lounge as the headlights of his car disappeared down the long driveway of the manor home. The Beckingridge empire is strong in the Shady City but they have their secrets. Music tutor, Vincent, is on the inside. They say behind mansion walls are where the true skeletons lurk. Click HERE to read Maestro. A war is brewing in the Shady City. The Mayor has gone missing. Bold reporter, Sam, seeks answers in the seediest club in town. Click HERE to read the full vol 1 of the Knock, Knock graphic novel series here on Vivika Widow Online. Also free to download for KU users.